I got into Motorola 680x processors first, and from there the obvious path was the 68000. Soon after the 68000 came out, Byte ran articles on not only the processor but also the computers that used it -- foremost the Apple Macintosh, but also the Amiga, Atari ST, Corvus Concept, Fortune 32:16 and others. When I started studying at the University of Stellenbosch in 1985, I found the Byte shelf in the Engineering Library, and my studies diverged somewhat from what the lecturers were trying to teach me. Design Philosophy Behind Motorola's MC68000, part 1, part 2 and part 3. My first 68000 system was homebrewed on three Eurocards. Read about it here. I've been using the Quelo assembler which I downloaded from somewhere. Here's a local copy QUELOASM.ZIP. This assembler can be used to assemble the tutornew monitor mentioned in the comp.sys.m68k FAQ -- I get a bit-identical image so things obviously work right. My notes on using the Quelo crossassembler. I've also played with EASy68K which does provide an IDE Integrated Development Environment) but I prefer the Quelo assember. WinHex is a Windows hex viewer / editor. It can join two ROM (Hi/Lo) files into a single binary. Tools -> File tools -> Unify -> Bytewise. File 1 is Hi, File 2 is Lo. Peter Stark wrote HUMBUG for the 6809 and 68000. It's free for non-commercial use by accepting this agreement. Steve over at Big Mess o' Wires made Linux run on a solderless breadboard 68008 (!). mc-hard 68008-Card for the Apple II (German), PCB layout (Rojas Darius Drepper), also better PCB layout (Delgen Technologies). Full article, translated. Greg Garner's 68000 32 bit division source code. 68000 Assembler/Simulator written at North Carolina State University's Electrical and Computer Engineering department. Matthew Brandt's C68K Compiler with modifications by Scott Howard. Motorola FBUG68K, Revision 1.1. As mentioned elsewhere, the filenames are somewhat stuffed. VU68K SBC from Byte, January 1984, and the VUBug monitor written by Russell Brown, supposedly for Raymond Carr's "Raymatic" 68000 Development Board. I think these might belonng together. Modula 2 source code for a 68000 cross-assembler. Bob Coates' Kaycomp 68000 SBC from Electronics & Wireless World, October 1985 to February 1986, May 1986. Wichit built a 68k Single Board Computer. Somewhere around 1994, Ingo Cyliax developed a 68030-based SBC with an ISA bus interface. Here's a mirror of ftp.cs.indiana.edu/pub/goo I made in October 1999. IDE hard drive interface for the Amiga that looks as if it'll work with any 68000. 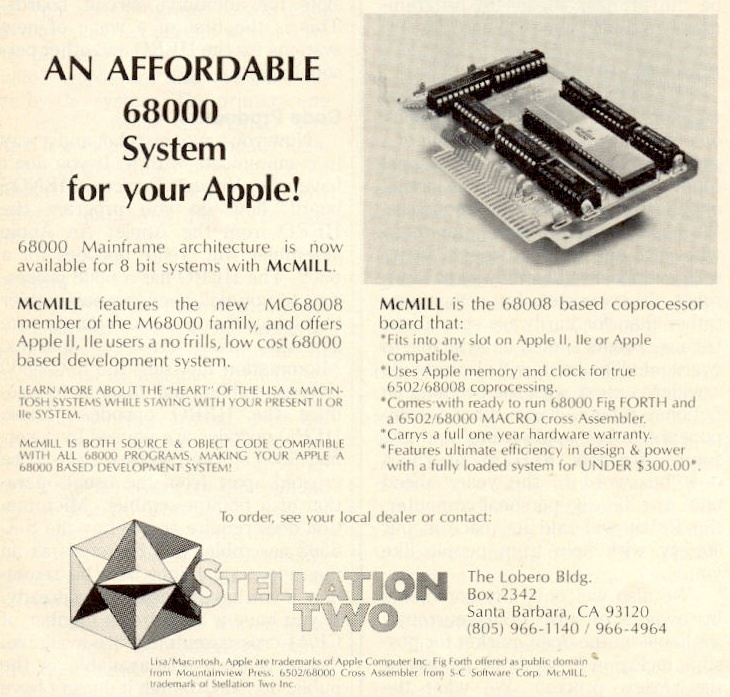 Karl Lunt wrote a 68000 ROM Monitor, which was published in the May 1989 issue of 68' Micro Journal ( copyright notice). If you type this in, please send me a copy of the binary? Karl also wrote SBasic, a compiled Basic for the 68HC11 and 68000. Paul R. Santa-Maria compiled an archive of most of the DTACK GROUNDED newsletters. Nice trip down memory lane. Motorola 680x0 Resources compiled by Paul RSM and hosted by ckelly at Easy68K. Hawthorne Technologies TinyGiant HT68k SBC on Rich Cini's pages. The Applix 1616 is an Australian 68000 computer sold in kit form. GCC MSDOS cross-compiler for the 68000 on ftp.lysator.liu.se. You might find the 68K Internet Resources page helpful. 68000 Tiny Basic Web Page. 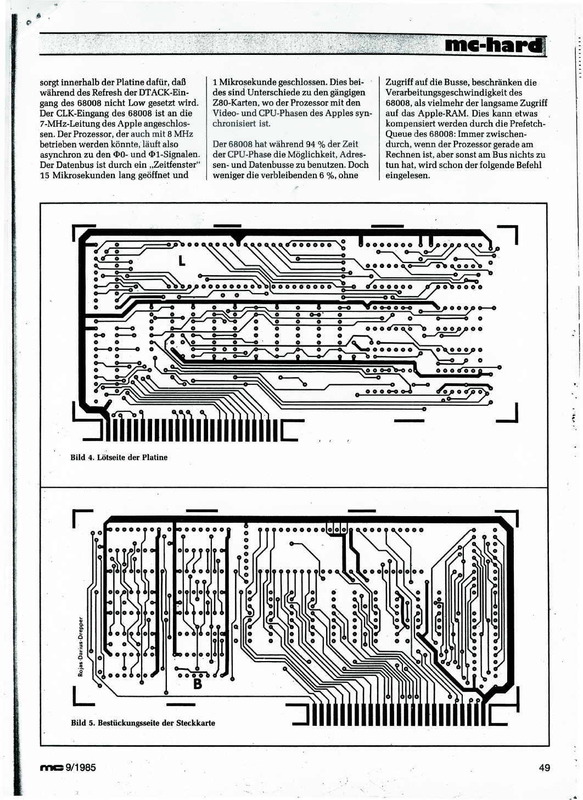 Geoffrey Brown and Kyle Harper's 68008 design from Computer Design magazine. Well, actually it's a repackaged AN897. Markus' version. Kiwi - a 68k homebrew computer (Yamaha V9990 graphics, dynamic RAM), and Lee Davison's Enhanced Basic 68k. Joe-Mon on the Beckman DU600 spectrophotometer.